Legacy Enterprise Resource Planning (ERP) solutions are no longer capable of keeping up with today’s fast-moving world – Enterprise Management is the new business reality. 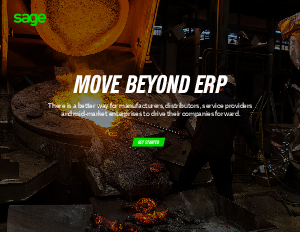 Whether you’re a manufacturer, distributor, service provider or mid-market enterprise, we’ll reveal to you a world beyond ERP. Download our new ‘Move Beyond ERP’ eBook to understand the business challenges you have, and how to meet them. Understand why businesses are outgrowing traditional ERP and are burdened by its inefficiencies. look at the benefits of Enterprise Management, which provides real-time data intelligence, improved forecasting, and accelerated business processes.